One thing is for certain: people can get frustrated easily when working with diverse, complicated documents. It is a constant struggle of handling too much information and some people are not able to use that to their advantage and keep up with usual daily tasks. This can be an issue for amateurs, professionals or anyone who works with a lot of data. To overcome these problems, people usually turn to online software to organize their work. And if you think about it, it has become almost impossible to imagine a day without an online service to support you along the way. One tool that helps you spend less time on preparing your presentations is Investintech’s PDFto PowerPoint converter. This tool can convert non-editable PDF files into fully editable PowerPoint documents, with high accuracy. The service is completely free and it’s a true lifesaver for people working on PPT presentations, regardless of their line of work. For example, if you are a project manager, this tool can save you hours by converting your PDF notes directly to PowerPoint. Teachers, on the other hand, can use this tool to prepare more appealing lectures for their class. These are just some examples how people can benefit from this tool. And the list goes on and on. Select the PDF you would like to convert. With its integrated OCR engine, the tool converts both native and scanned files. Press the Start button to upload and convert your file. 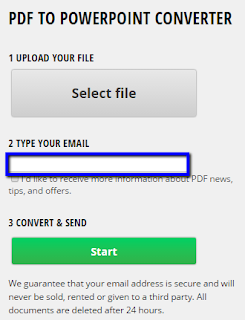 After some time, you will receive a link with your converted document. The conversion is quick and accurate, with no limitations to the file size or the number of pages you can convert. Important thing to know is that your files will be deleted from Investintech’s servers after 24 hours, so don't forget to download them on time. This is just one of the many tools for those moments when you get stuck and need some help. Of course, there are plenty of different PDF tools for different problems. For example, if you need to edit just one or two sentences in your PDF file you can use Investintech’s PDFEditor, which comes with a 7 day free trial. So, there you go, a quick PDF toolkit that can save you hours per project and leave you completely stress free with a focus on results. Do you use any other productivity software? Feel free to share your thoughts in the comments below. If you’re a businessman who lives and works in the 21st century, there is a strong possibility that you’ve experienced on your own skin the frustration of having to edit a scanned PDF of an important document that you’ve received from a business partner or a colleague. It is always quite unpleasant having to deal with this type of situation, but even more so if the need to finish this task is urgent and other pressing tasks are dependent on it. The files that are most frequently scanned and later converted to PDF form are Excel spread sheets, who with their all-around capabilities are fantastic for all sorts of things, from invoices, work reports, business plans and much more. 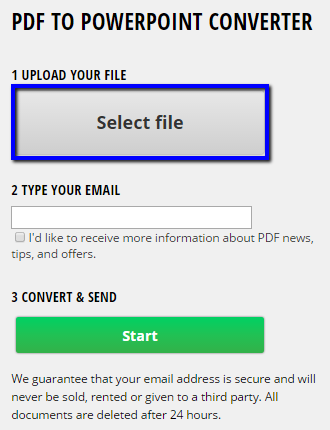 The first thing we should cover is clarifying the need to send a PDF file, instead of some other file type. This format was developed by the Adobe corporation in the last decade of the 2000’s, and not long after it became the top choice for sharing of document-type files between computers, and later on from computers to other devices (smartphones and tablets), and vice versa. But, what makes this format so different from others, and why are they so tricky for editing? The PDF is a completely standalone file format, meaning that it doesn’t depend on any software, hardware or operating system to present documents, which makes it perfect for sharing, because the user knows that if he sends the file to someone else, the other person will be able to view it perfectly no matter if he opens it on a Windows computer, or a Mac, or his iPhone, Android, or any other device. But, once the PDF is created out of another format, it automatically becomes a read only file, and the only way to change it is to use specialised software or tools designed just for that task. 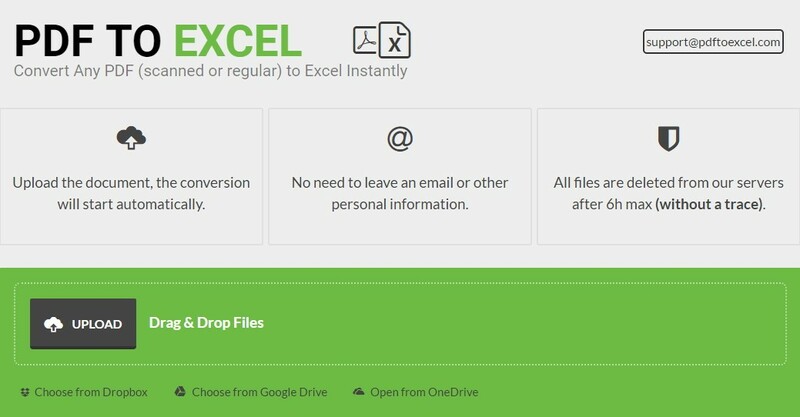 A great free tool for converting scanned (and regular) Excel files is PDF to Excel, an online tool with whom you can transform your PDF file back to Excel in no-time, and get back to your important work with very little time spent on this trivial at first glance, but in this case, quite necessary task. Using this tool, you have an option to load the file from your hard-drive, or to upload it from one of the three biggest cloud services in the world right now, Google Drive, Dropbox and OneDrive, another feature that can undoubtedly save some precious time. As far as conversion time goes, it usually lasts for about one minute for standard-sized files, and there is no limit for the number of conversions, nor for the size of the file. It’s important to note that scanned PDF files are rather complicated for processing, but using the advanced Optical Character Recognition technology (OCR), they won’t pose a threat to this tool. So the steps go like this; first-off you should choose the file for converting, clicking on the upload, or one of the cloud-services buttons. 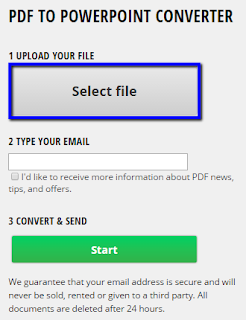 After you’ve chosen the file, the conversion process will begin automatically, after which the download button will appear. And that’s pretty much it! Another feature that should definitely be noted is that this tool doesn’t require any kind of personal information given, which is utterly rare among this types of tools. Also, all files uploaded to the server of the company are deleted after six hours in batches, and user privacy is absolutely guaranteed. This is all that we have prepared for you today, and next time before you get upset after you received a PDF file in your inbox, remember PDF to Excel online tool, and get the job done so much quicker. 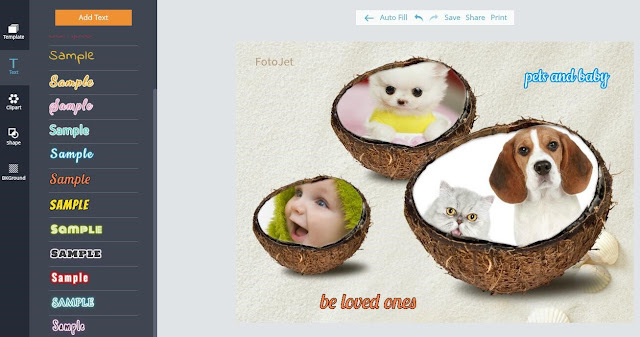 How to create photo collage online..
FotoJet, a free online collage maker, you can use it to turn your photos into splendid collages. Then after you finish them, you are allowed to share them with your family and friends via social platform. 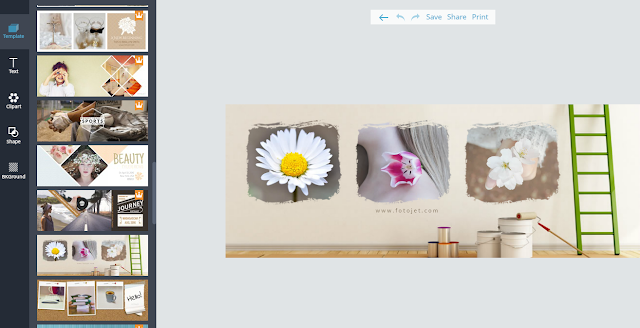 FotoJet provides 700+ creative collage templates and 80+ classic collage layouts for you to use. You can use it smoothly in any browser. There are two major parts they are design mode and collage mode. In the following paper I will give you some details about how to use them to make your own creations effectively. DESIGN mode, a powerful editor, is newly added to FotoJet, 200+ revamped and 70+ newly designed templates are provided for you to make your own creations. You can also use 80+ shapes & lines to modify your designs, and search 580,000+ images and 93,000+ clipart from Internet to customize in your pictures. All these new features ensure you more convenient to design unique creations. It contains the following categories, and they are all very popular now. In DESIGN mode, there are 300+ social media graphics such as Facebook Cover, Facebook Post, Instagram Post, Twitter Header and YouTube Channel Art. What’s make it different from collages is that all these templates are embedded with wonderful pictures. You can get your designs in seconds with some adjustments and then save or print them out, at the same time you can share them to popular social platforms. The following will show you how to use it. Take Facebook cover as an example. There are plenty of template provide by design mode, click the one you want, and you can print it out or share to popular social platforms after some slight adjustment, for they are embedded with beautiful pictures. Or you can add photos from your Facebook or computer, and what’s more you can search 580,000+ images from Pixabay and choose whichever you like to add. In this way you can make an outstanding Facebook cover which come from your own Facebook cover photo design inspiration. 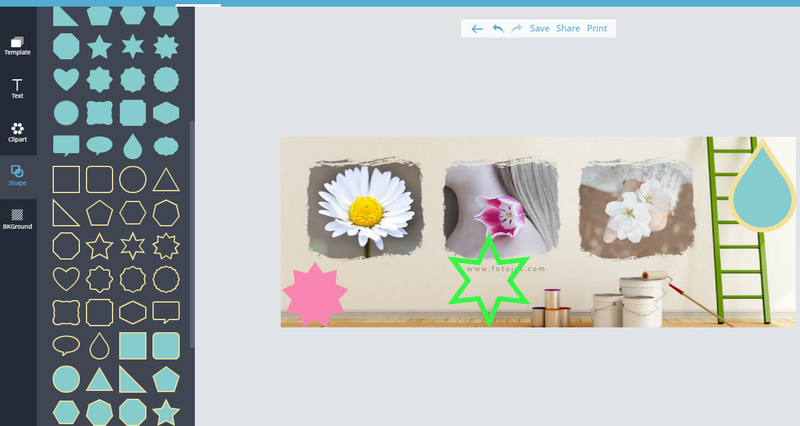 Design mode enables you to add 80+ shapes & lines to beautify your creations by simply dragging or with just one click. You can arrange them at will by moving, resizing and rotating. These shapes can be divide into three kinds, just choose the most suitable one to use. Here I will show you a sample. Additionally, design mode makes it more convenient for you to search online clipart to add into your creations in DESIGN mode. You can search 93,000+ clipart from Open Clipart, I believe your need can be met there no matter how particular you are. What make you more excited is that the clipart you added can be freely adjusted with color overlay. You can make them into all what you love. Besides, design mode provides many new background resources for you to beautify your creations. So don’t worry that you may not like the background which contained in the template, you can change it into whatever you need, it can be one in the sample or it can from your computer. 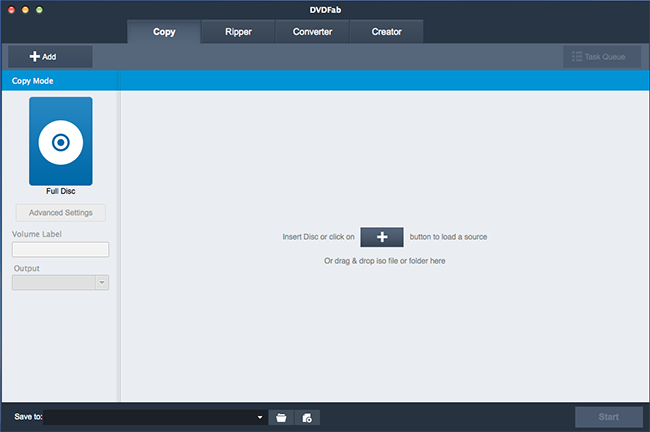 With so many great new features and under a more intuitive GUI, you are able to unleash their creativity to the most! Now your unique design is ok, just print it out or share it with your friends. 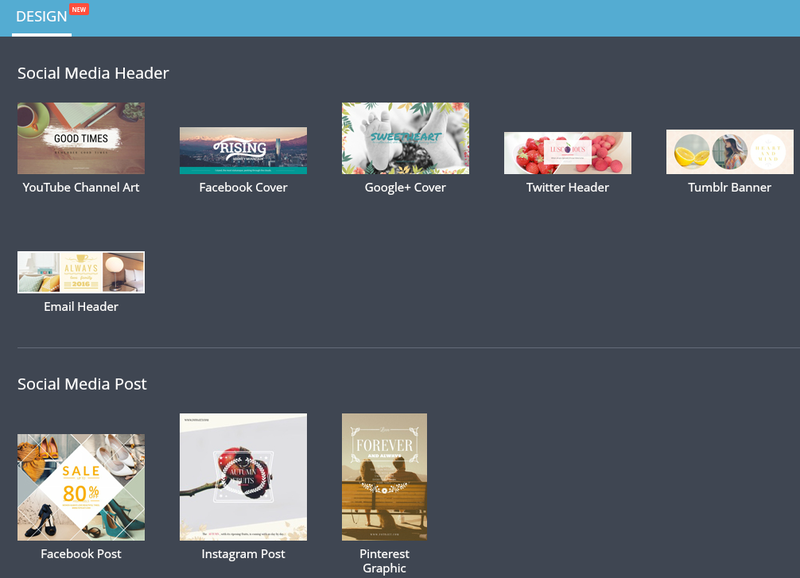 Users can make classic or creative collages from 80+ layouts and 600+ templates on collage. 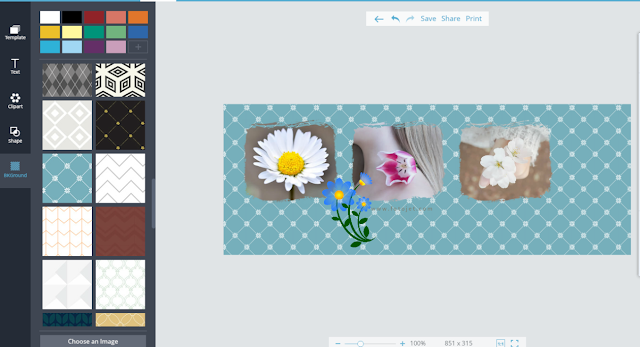 It can be use to make all kinds of collages, misc and photo cards. You can use it to make some special mother’s day cards or father’s day card sends to your mother on mother’s day or father on father’s day. Now, I will show you how to make them. 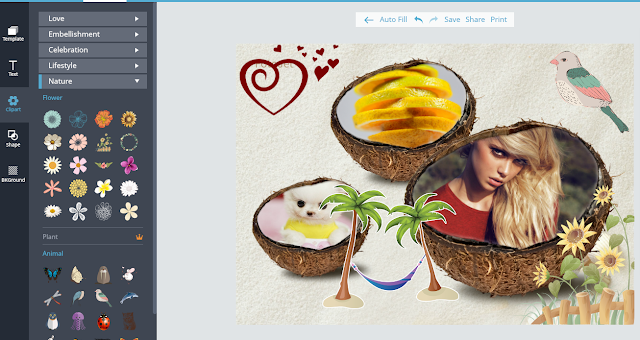 Take creative collage as an example. What you need to do is just the following few steps. Open templates list, there are many fantastic ones here. Just choose whichever you like and click it. The template you need is added in editor. If you find that you need to change a template, what you need to do is just click the other one you like. It will change into the one you want. There are two ways for you to add photo. You can add them from your Facebook, or you can right add them from your computer. 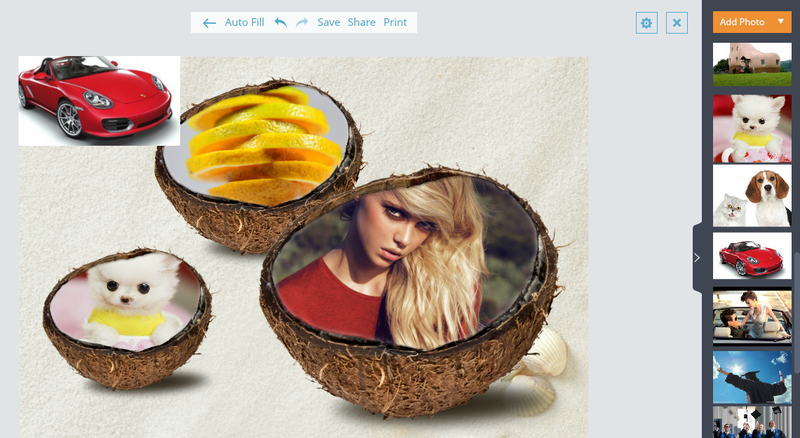 Just add the photos you like, after that you are allow to add them as what the sample shows or add some to beautify your creation. For the former one, you just need drag the photos you need or prefer to the place you need. For the latter one, a simple click action is enough. In the following picture, the car is added by click, and others are added by drag, you can have a clarified understanding of this by the below picture. Use some text to express your feeling or whatever you love to put on it. Come to text and choose one of the text samples you want, and click it. Then you can arrange it to a proper place, and start to edit it with your own words. After that you can change its color, shape and size into your favorite one. 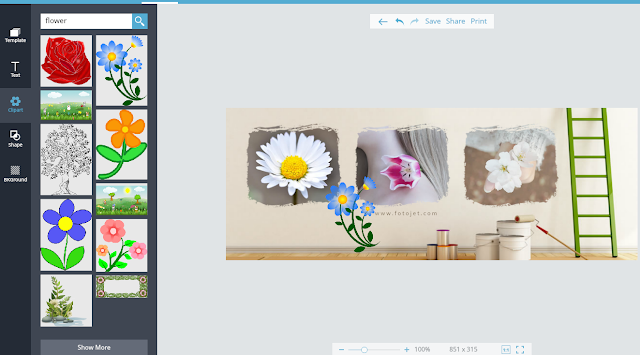 Add some clipart to modify your picture. There are hundreds of clipart provide for you. Open the clipart list, and pick up some one you like by click them. Its size and location can be arranged as you like. What’s more, if you don’t like the background, you may change it to whatever you love, you can change it into one of provide samples or choose a nice picture from your computer. Up to now, the collage can be printed out or share with friends immediately. Microsoft Word is the best known and widely used word processing application. From legal documentation and academic papers business memos and professional reports, Microsoft Word is the go-to tool for creating and editing text documents. However, when sharing your .doc files with other parties, you can’t be sure that the person you are sending the file to will see it in the same way you do. They may be using a different operating system, a different word processing software or even a different version of MS Word. In all cases, there’s a high possibility that the document formatting will be skewed. This is why transferring your documents into the PDF format before sharing them with other users is the safest choice you can make. That way you’re confident that everyone will see the document’s layout in the same manner, no matter which device or software they’re using. Yet, there’s a problem with PDFs, as well. This format, by its very nature, is not an editable one. If you want to reuse or change some of the text locked inside a PDF, one option would be to retype the text into MS Word. Depending on the size of the file, this can take hours or even days. Not really time well-spent. 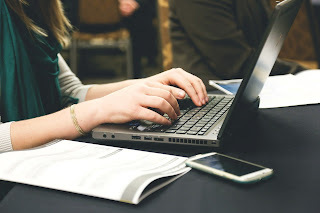 A far more productive and time saving solution would be to use a software application that extracts text and other information from PDF file into an editable .doc or .docx format. With an appropriate PDF to Word Converter, you get the best of both .docx and PDF worlds - the first one for editing and the latter for sharing and archiving your documents. 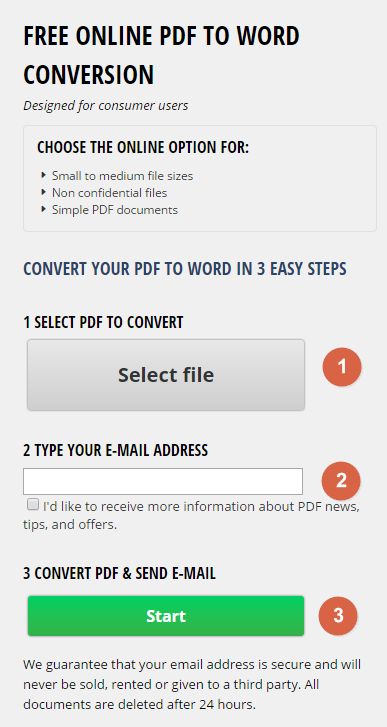 You just need to make sure that the PDF to Word converter that you’re using is reliable, accurate and easy to use. 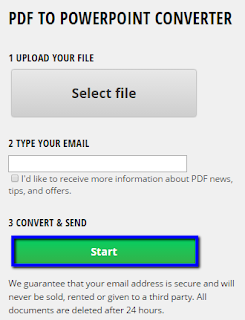 Within minutes, you’ll receive an email with a download link to the converted file. This link will be valid for 24 hours after the conversion. Once 24 hours have passed, all your personal information (both email address and document sent for conversion) will be deleted permanently. Investintech, the company behind the converter, respects its customers’ privacy, and as such, they guarantee that all the personal information they receive from users will never be shared with anyone else. Following the latest tech trends, we can't but accept turning our traditional office into a digital workplace. Buying different gadgets for better business performance is just a start. It’s useless to have powerful machines without using document management programs. Such programs help you be more efficient in your work and have become a must-have in everyday business world. If you choose to scan your papers and turn them into digital format, you will have all that paperwork in your computer. The thing is, you will sometimes need to rework some of your documents and that can be a daunting task if the document is scanned. Luckily, with PDF Converter Elite you can convert scanned files and actually extract data you need from scanned image into an editable document. 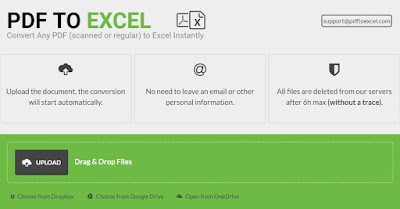 And what’s more, there is an additional feature for personalized conversions of PDF files to Excel which helps you edit tables, and adjust rows and columns according to your needs. 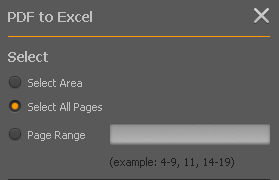 You just need to open a PDF in PCE program, click on Excel button and then choose “Advanced options” button which will open the panel with different Excel settings you can apply to your document (as shown below in the picture). Sometimes you need to edit the whole document and there is no need to convert all of it. That’s why select options are useful; you can choose to convert the whole document, specific pages or a specific area as shown in the picture below. Go to the View menu and click to open PDF Creation Options window as shown below. 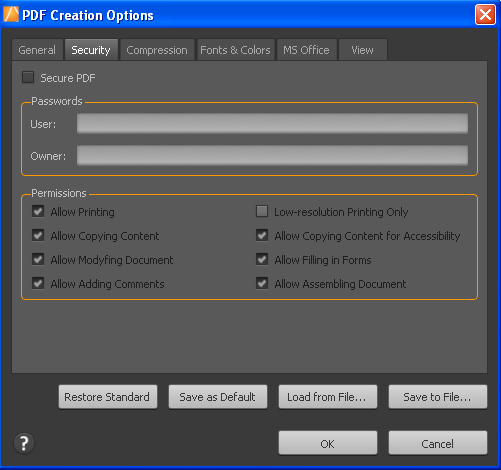 After you tick the box “Secure PDF”, apply different permissions and set a password, click OK.
Then click the Create button from the menu in order to open a document that you want to save as secure PDF. In this way, only people who have the password will be able to see data from the document. In traditional workspace you used to leave comments on your papers by writing them down with a pen. Now, there is an option in MS Office to leave comments to your coworkers. It makes your team collaboration easier. When you complete your report or other business document, you may want to keep those comments there, for future reference. That’s why this additional PDF creation option can help you. Just open the same PDF Creation Options window as described in the previous paragraph, then click the tab “MS Office” and tick the box “Retain comments from source documents”. Moving from traditional workspace to digital one can be very time consuming, but in the end it pays off. Download PDFConverter Elite and find out if that’s the right tool to help you deal with digital paperwork. Do Your Data Recovery Professional is a powerful yet easy-to-use program to recover lost files from hard drive or removable device. This hard drive recovery software makes it easy to retrieve lost photos, videos, documents, emails audio or other files in simple steps. With powerful data recovery features, it also can recover lost files from deleted/lost partition or raw device etc. A lot of error operations or unexpected accidents would result in data loss on hard drive. The most common data loss situation is data loss by deleting. Imagine that you deleted your vocation photos without backup and had emptied the Recycle Bin, what should you do? Do Your Data Recovery Professional will allay your worries within minutes. It can easily and quickly recover lost files due to deleting, formatting, partition loss, virus infection or other unknown reasons. It supports to recover all types of lost files and is fully compatible with Windows 8, 8.1, 7, vista, 2000, XP and upcoming Windows 10. Besides finding lost files, it also lets you preview them before saving. 3. 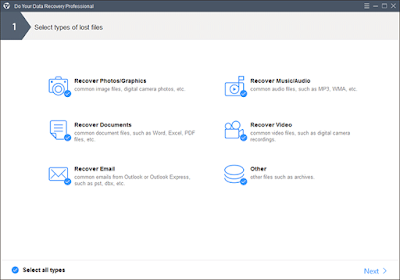 Preview and recover the file you want. DVD Backup is the best way to prevent your precious legitimate DVD discs from being worn out and release your physical space. Searching on the Internet, there are so many programs may confuse you, while no one comes easier and more powerful than DVDFab DVD Copy for Mac. It is a total Mac DVD copy software in support of your iMac and all Mac OS varies from v 10.6 to 10.10, and functions as a DVD burner and DVD cloner for Mac. With it, you can, make backup copies of your DVD collection to digital files like ISO files and movie folder storing on your PC or hard drive for viewing, also burn your local ISO file or folder onto DVD discs. As a qualified DVD copy software for Mac, DVDFab DVD Copy for Mac is capable of decrypting all kinds of DVD discs. Its built-in codec can remove all the protections embedded on either the classical DVD movies or the newest blockbusters. Also, the region code restriction will be removed, you can play the DVD discs you bought from U.S to the media players or other devices produced in U.K or other else. DVDFab DVD Copy for Mac is a comprehensive DVD copy program which accommodates both beginners and senior users. 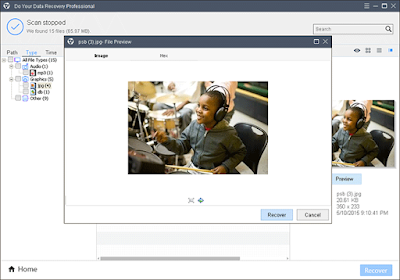 Its intuitive UI enables users to make one click DVD copy, while its advanced settings make users the impression that you are like a professor in DVD copy. You can personalize and customize the DVD copy to make the result to be what you like. DVDFab gives you the total right to define the whole DVD copy process. With its six copy modes provided, you can copy everything on the DVD or the longest time duration (the main body of the movie) only. You can also copy any specific part you need, or make a lossless DVD copy with the sound tracks and subtitles completely the same as the original DVD by cloning it. If you want to combine several DVDs into one, or only several titles come from them into one DVD, you can have it done by DVDFab's Merge mode. And if you want to copy a DVD-9 to two DVD-9, then Split will help you. Except for Clone, the mode make lossless DVD copy, you can make a compression by choosing every copy modes of DVDFab DVD Copy for Mac provides. You can shrink DVD-9 to DVD-5, and vice versa. Apart from the settings, the real DVD copy just requires you take a click to trigger the Start button. Then the task begins immediately. Generally speaking, the final processing times will be totally determined by your PC hardware performance, the source size and the writable device. But DVDFab DVD Copy for Mac can greatly speed it up with the leading speed due to its batch copying, multi-core CPU, NVIDA and CUDA support. The processing window will show you everything about the progress including the progress state, the elapsed time and estimated left time. You can order your PC to shut down, exit program, hibernate or do nothing after the process is done. Home automation is one of the fastest-growing and most exciting genres of consumer technology these days. What may or may not have started as a gimmick has begun to offer legitimate innovation, convenience and enhanced security, and the streamlining of your home’s gadgetry. In the past couple of years, we’ve seen several companies emerge as the frontrunners of the modern smart home, but there are always newcomers who are arriving to the scene, releasing their own versions of products that innovate in new ways. Despite just about everyone wanting their home to be a smart home, you might say that the home automation market is at risk of becoming a bit saturated; when there are several gadgets competing to fill the same spot in the home automation spectrum, how are we supposed to choose which smart home tech to get? Here are some of the coolest, most innovative and useful home automation technologies that stand out from the crowd. You’ve probably gotten into bed at night and shivered as you wished there could be a way to warm your bed up before you get into it. Or maybe during the night, you’ve woken up just long enough to throw the blankets off and wish there was a way to keep your bed cool as you slept. The answer to your prayers is the Luna Smartcover, a cover for your mattress that makes your bed smart. 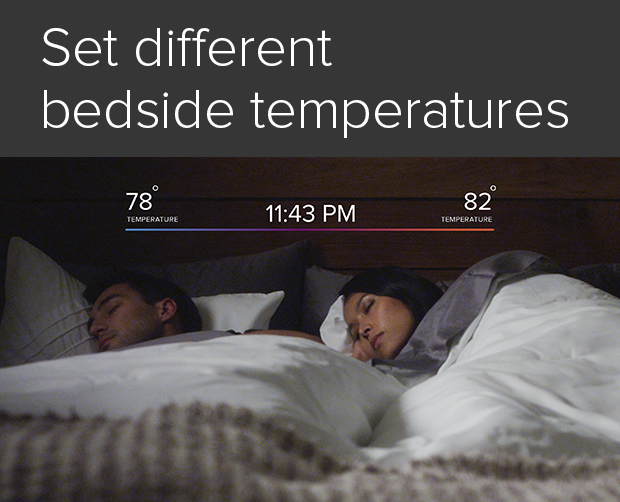 Much like the renowned Sleep Number beds that have dual controls on each side, Luna gives you the ability to control the temperature of your bed on both sides or either side individually, right from your smartphone or tablet. It’ll also learn your temperature preferences and schedule over time, which means that at a certain point you’ll practically never need to adjust the temperature manually. Luna monitors your vitals and tracks your sleep patterns like the wearable tech available today. It’s also a smart alarm, can connect to most major home automation systems including the Nest Learning Thermostat, and is available in several mattress sizes. Currently available for preorder through crowdfunding site Indiegogo, Luna currently starts at a reduced $235 for the full-size mattress and is slated for release early this summer. After you’ve had a gorgeous night’s sleep on your smartbed, you should have the perfect cup of coffee waiting for you in the kitchen. 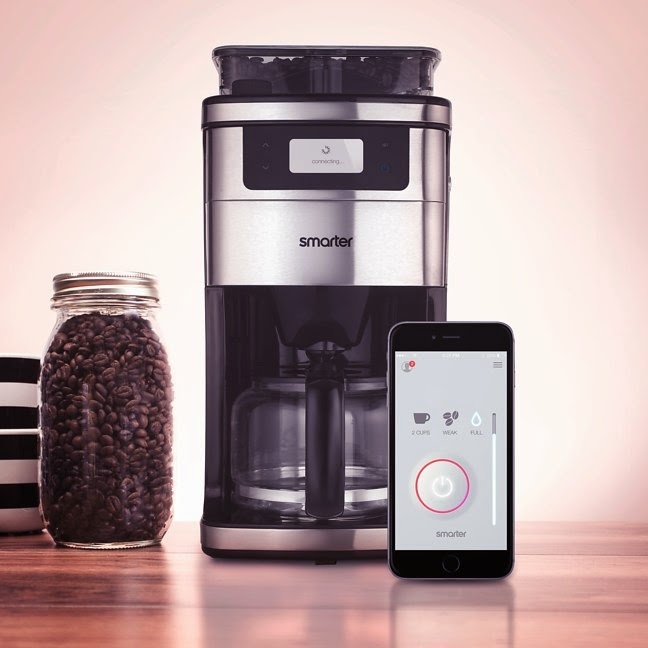 The Smarter Coffee Maker is an innovative smart appliance that eliminates the possibility of human error in coffee brewing, such as making the coffee too strong or too weak, or somehow getting grounds into the carafe. Via the accompanying app, simply specify how much coffee you want brewed, your desired strength, and then activate or schedule the coffee maker to being brewing. All you have to do is periodically refill it with whole coffee beans and water and remove the used grounds; the machine grinds only the beans it needs for each brew, ensuring that you have the freshest, most delicious coffee each and every time. The Smarter Coffee Maker can currently be preordered for about $230 and is expected to ship in late May. Users of iOS devices have Siri at their beck and call while Windows Mobile offers Cortana and Android users have Google or Google Now. 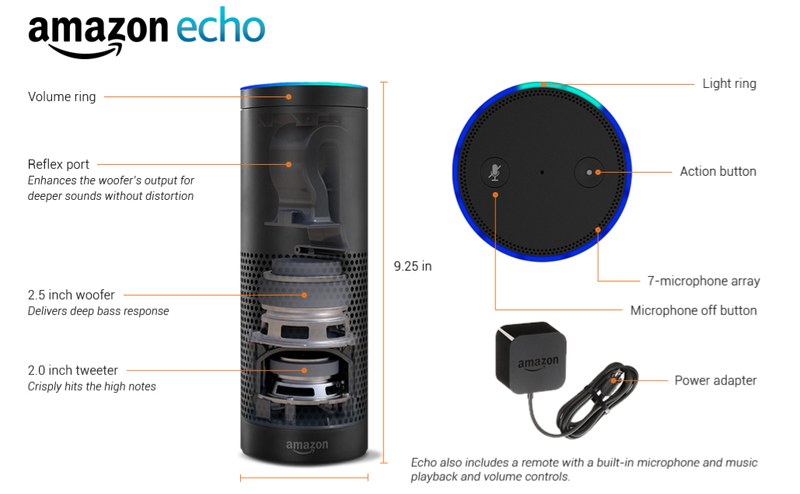 Echo—created by online retail mecca Amazon—could be compared to Google, Siri, and Cortana, but it’s a voice assistant for your home rather than a mobile device. 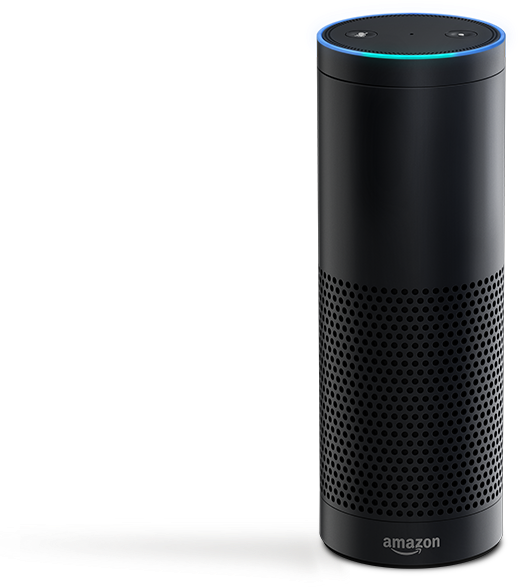 Amazon Echo is a nine-inch cylindrical Bluetooth and WiFi smart speaker with seven internal microphones with a multicolored LED ring and two physical buttons on its top. It can play music from connected devices like any other wireless speaker, but Echo has impressive brains that make it an incredibly innovative device. Inside Echo lives Alexa, the female voice that can control your connected devices, answer your questions, and so on. And since there are a number of powerful microphones inside Echo, Alexa can hear you speaking at normally volume from across a large room and can deduce whether you’re talking to her or to an actual person; in other words, no more yelling. There’s also an app that gives you full control of Echo directly as well as the included mini remote control. Essentially, there’s not much that Echo can do that Google Now or Siri can’t do at the moment. However, Echo is cloud-connected and, with future updates, promises full integration with smart home tech, which is going to make Echo astronomically more useful, a must-have accessory of home automation systems. Right now Amazon Echo can only be purchased from Amazon by invitation, but anyone can request an invitation to purchase Echo for $199; Prime members invited to purchase Echo are offered a reduced price of $99. Say goodbye to those unsightly window units that have to constantly be adjusted and readjusted in order to keep your home at a comfortable temperature. 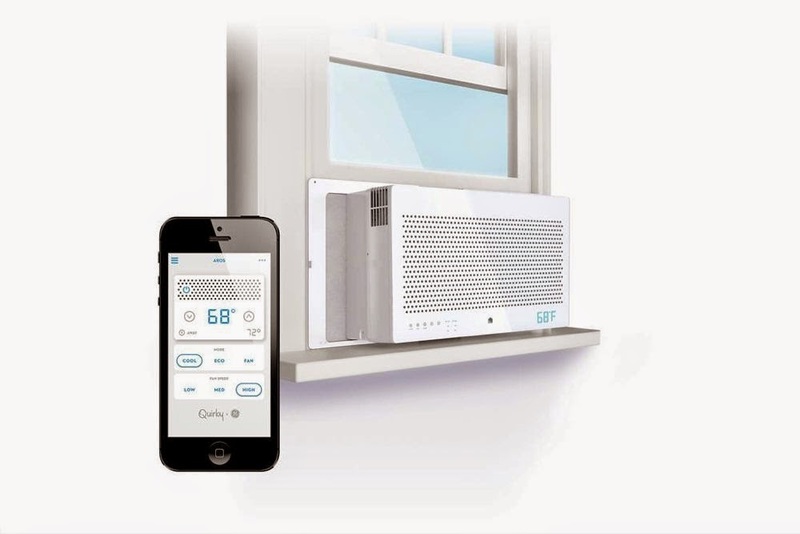 The first thing that many notice about Aros—the smart air conditioner developed by Quirky, known for the Wink home automation platform—is its sleek, attractive design. The 8,000 BTU unit is all-over white and displays the temperature at which it’s set via the discrete LEDs in the front corner. Once it’s connected to the Wink app via your home network, you can control the Aros remotely whether you’re sitting two feet away or leaving work. The main purpose of Aros is to keep your home cool while using as little energy as possible. One function that allows the Quirky Aros to do this is the Smart Away feature, which uses geotagging with your phone’s GPS to detect when you leave home and when you return; this allows Aros to turn itself down or off when you leave, but to begin cooling as you approach your home. The Aros is available for many retailers and has recently dropped in price, allowing you to pick up this smart air conditioning unit for between $250 and $279 just in time for summer. 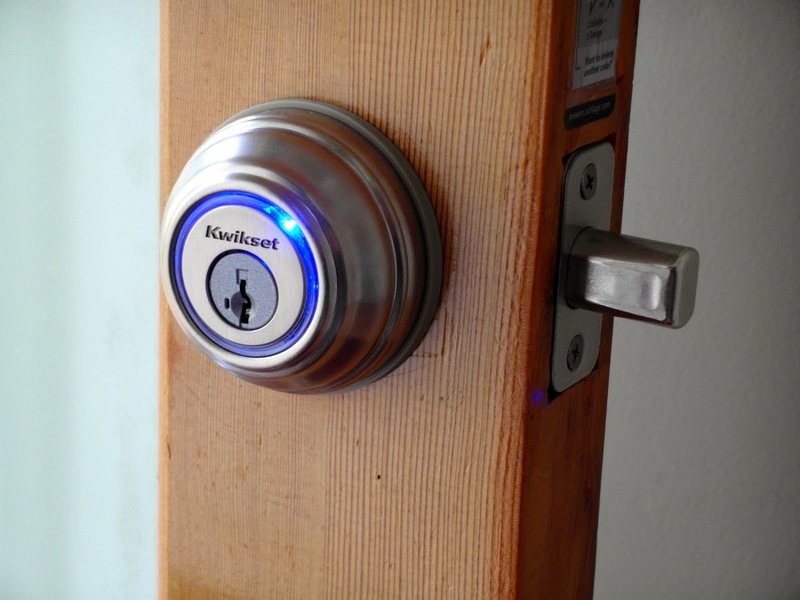 Of the smart locks and deadbolts on the market currently, the Kwikset Kevo is arguably the most capable, functional, and full-featured. Kevo gives you three secure ways to unlock your door and enter your home: Using either the traditional metal key, the included key fob, or by turning your smartphone into an electronic key, or eKey. Any smartphone with compatible Bluetooth can be assigned either a temporary or permanent eKey, then users simply touch the Kevo lock while holding onto their smartphone and the door will unlock. Additionally, Kevo connects to your home network in order to function as part of your smart home as it’s compatible with many other home automation tech like the Nest Learning Thermostat and Wink platform. It can also be setup in such a way that the door automatically unlocks as you approaching using your smartphone’s NFC capabilities. Kevo is fairly simple to install and can be locked and unlocked remotely using the accompanying app, which is also how you assign eKeys to other residents of your home as well as to temporary visitors. The Kwikset Kevo smart lock is available for $219 from a number of retailers. For more home automation ideas, head to Modernize.com. How to fix WdsClient error when install images using Windows Deployment Service? Device Manager is blank or empty - How to fix it?